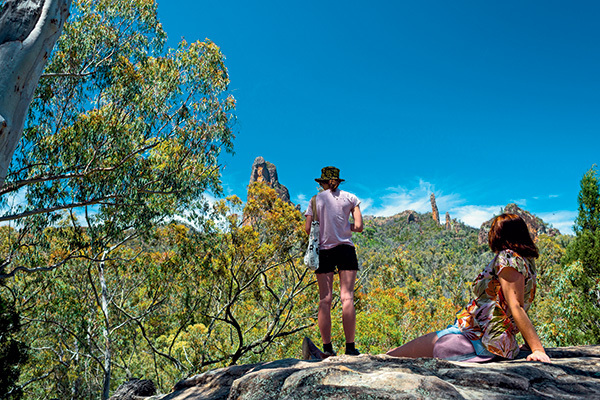 There’s an old dad joke about camping being ‘million-star accommodation’, but nowhere does that ring more true than in the Warrumbungle National Park (NP). Spend a night here and you’ll almost need sunglasses to shield your eyes from the radiant Milky Way above. It’s no accident that this is the site of Australia’s premier astronomy facility, Siding Spring Observatory, home to $100 million worth of research equipment including 52 telescopes. 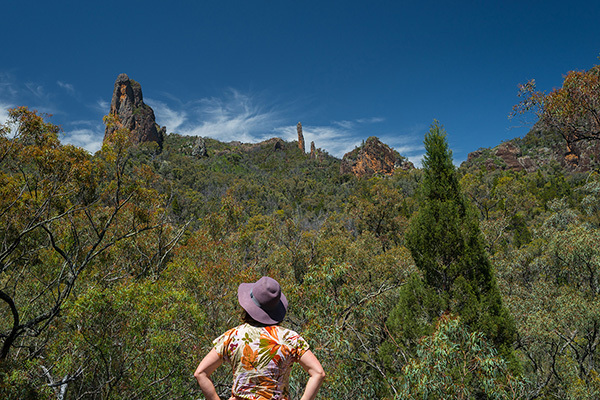 Positioned high in the Warrumbungle National Park some 1160m above sea level, the site was chosen for its crisp, clean air with minimal humidity, its non turbulent atmosphere, its lack of light pollution and its high percentage of clear nights. And while these conditions clearly excite astronomers both professional and amateur, they’re not too bad for campers, either. And then there’s the scenery. 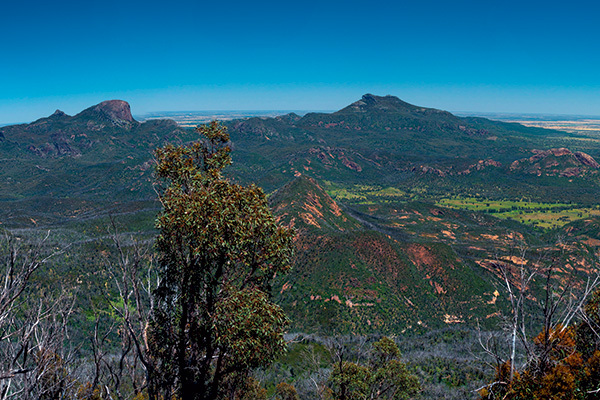 The Warrumbungle Ranges is the crumbling remains of an ancient volcano that erupted some 14 million years ago. It rises from the surrounding plains like an unlikely cluster of icebergs, its jagged peaks and spires visible for many miles in all directions. And when viewed from the top of the range those endless plains stretch on for hundreds of kilometres; you’ve likely never seen so far. These giant, lava-born structures rise from the park’s savannah grasslands and dense bush still recovering from the catastrophic 2013 fires that tore through the park in 2013. Travelling at 80km/h the fire consumed everything in its path and was quite a site for local residents living in nearby towns. A friend from Coonabarabran told me the mountains alight at night closely resembled Mordor from Lord of the Rings. Scary stuff. And while the bush is restoring nicely and the landscape is now lovely and green, the upside to the bushfire and the thinning of the vegetation is that it has exposed previously unknown intricacies in the rock formations. Swings and roundabouts, I suppose. There’s no getting around the fact the Warrumbungles is not an offroad destination. Occupying a compact 57,600 acres, there’s a quality tarmac road running right through the middle which branches off to deliver revellers to a string of excellent campsites. You’ll not need your all-terrain tyres but you will need your hiking boots: this is a bushwalker’s paradise. For a short, easy walk try the Wambelong Nature walking track which is just 1km, or for a short but challenging walk, Spirey View at 3.3km. 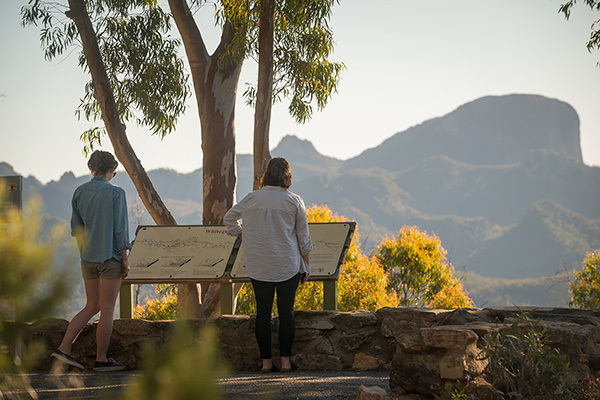 For a spectacular sunset location, visit the easy-to-reach Whitegum Lookout which is wheelchair friendly and affords stunning views across the park. One thing’s for sure, there are some excellent campgrounds in the Warrumbungle NP. We stationed ourselves at Camp Blackman, near the visitor centre. It’s the park’s main campsite and offers large, grassy powered and unpowered sites. There’s a smattering of trees for those who like shade, and excellent amenities including free hot showers. There are firepits, barbecues and picnic tables, but our favourite part was the scenic outlook; the camp seems to be nestled in against a rocky outcrop. Another great option for camper trailers and caravans is Camp Wambelong, a smaller, quieter campground on the banks of Wambelong Creek with spectacular views of Belougery Split Rock. There are toilets (but no showers), barbecues and picnic facilities. 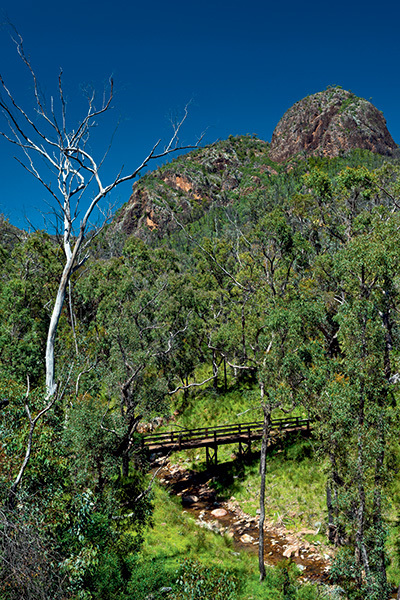 As you approach the Warrumbungle NP you might notice a series of observatories gleaming white in the sun atop one of the highest peaks. 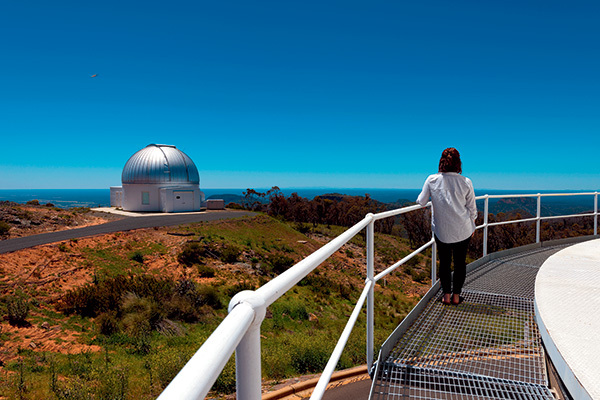 This is Siding Spring Observatory, an active astronomy and astrophysics research centre operated by the Australian National University in Canberra. Built in the early 1960s, this world-class research facility is home to 52 telescopes owned by countries from all over the world. The largest is our own Anglo-Australian Telescope, a 3.9m giant that has ranked amongst the most productive telescopes in the world. There’s even an observatory filled with small telescopes that astronomers from all over the world pay membership to access, using them remotely from wherever they happen to be stationed on our vast globe. 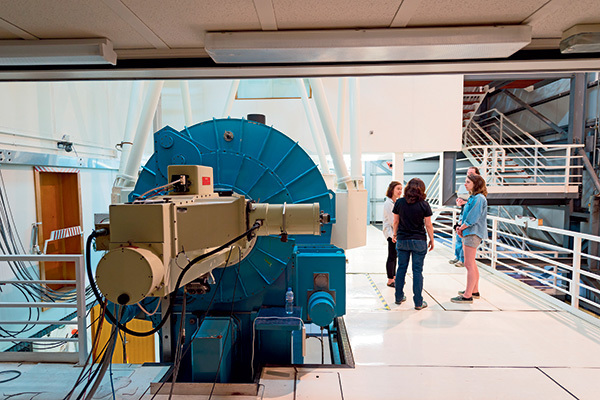 Each and every night, millions of dollars worth of research is conducted at Siding Spring Observatory. Of course, being an active research centre visitors cannot roam around, however there is an excellent interpretive centre and cafe on site so if you need your caffeine hit while camping in the park, this is where to go. Guided tours are offered during NSW school holidays, and groups of 15 or more adults may apply for behind the scenes walking tours. 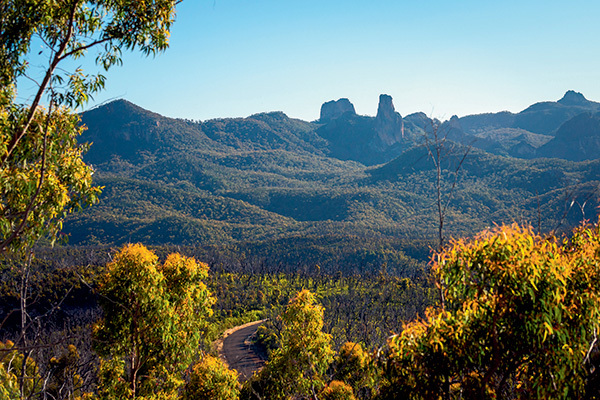 Warrumbungle National Park is accessible via Coonamble, Baradine and Gilgandra, but its closest town is Coonabarabran, 25km to the east. The jagged rock formations of the Warrumbungles were formed by lava flowing from an ancient volcano, active 14 million years ago. So suited to stargazing is the Warrumbungle NP, in 2016 it was proclaimed the first ‘dark-sky park’ in the Southern Hemisphere by the International Dark Sky Association (yes, it exists). Camper trailer camping is available at several camping grounds within the park, including Camp Blackman where we stayed. Check out the full feature in issue #112 of Camper Trailer Australia magazine. Subscribe today for all the latest camper trailer news, reviews and travel inspiration.